A warning - if you love light colored interiors, be aware that you have to do more cleaning care than ordinary. It's a fact of life, not something that Ford did wrong. 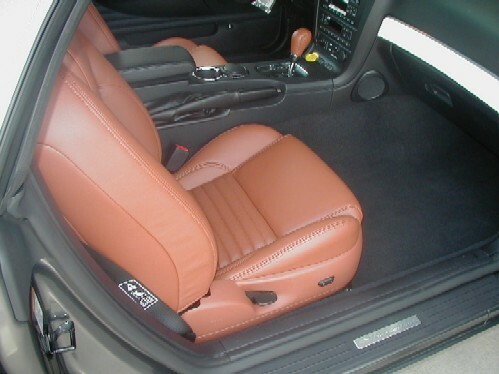 You're not dealing with an easily cleanable vinyl but a real, "live" leather. It will stain, it will wear. 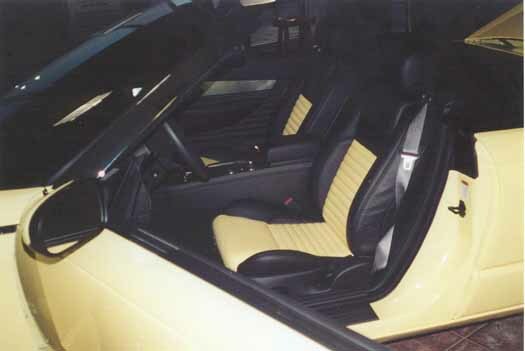 Full Color Accent is noted by accent color on the doors, lower dash and console along with the seat inserts, shift knob and top of steering wheel --Not available with deluxe, soft top only model in the USA - according to the brochures - BUT was available premiums and on the Canadian 2002 models. Photos clickable for larger views.
. Colors available in 2002 are yellow, blue, and red. 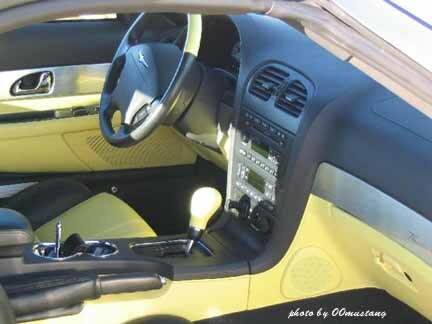 Yellow and Blue were only available with same color exterior. .
Full color Accent in an Inspiration Yellow car - only for 2002 . .
Red Full Accent interior is available for 2002 2003 for the red, black and white exteriors. 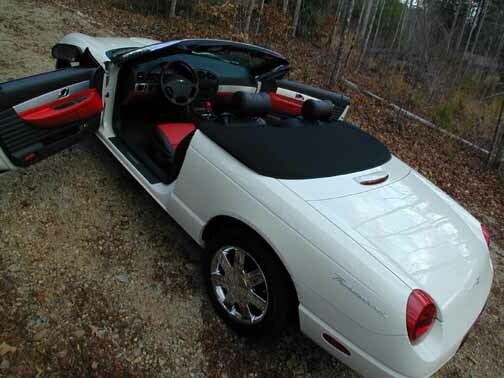 . .
For 2004 it's available only with the red and black exteriors premium models. 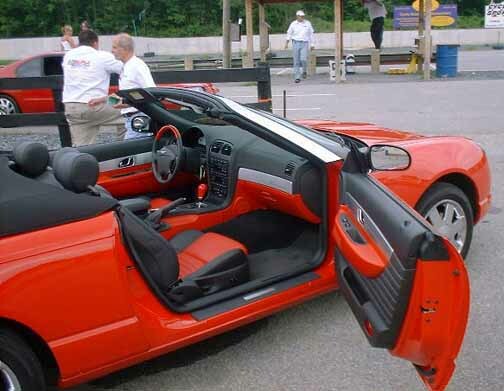 Full Color Red Accent in a Whisper White car. Full Color Red Accent in a Torch Red car. 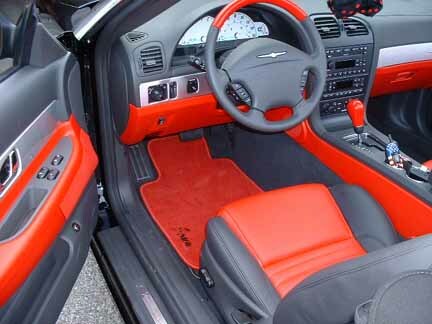 Full Color Red Accent in an Evening Black car along with custom floor mats. 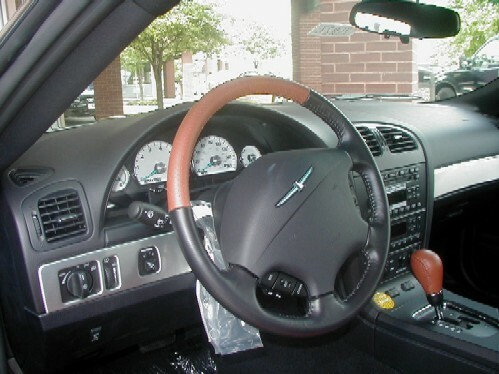 Upper third of steering wheel is red perforated leather. Shift knob is also covered in red leather. 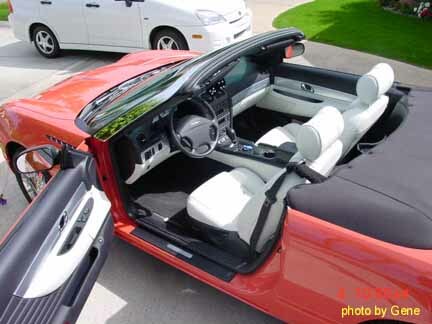 has full "light stone" seats, visors, header, and dash inserts along with med stone soft top and boot and floor mats. 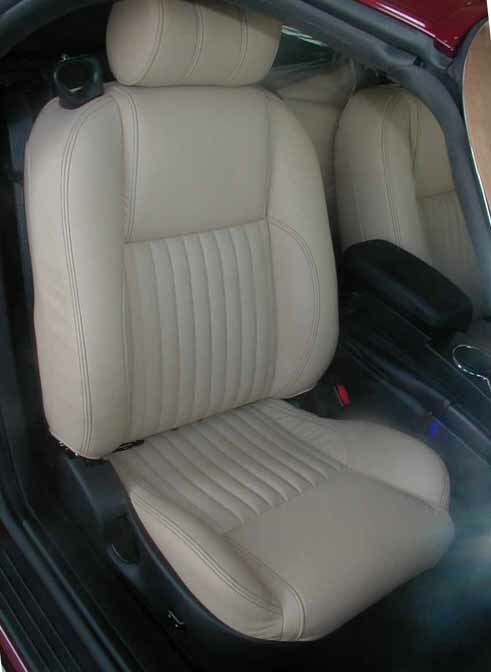 The roll pleats on the seats are horizontal, like the pleats on the 2002s. 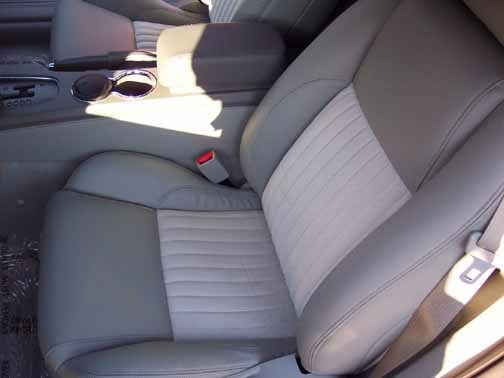 Seat inserts are not perforated. Available with the Desert Sky Blue, Torch Red, Evening black, & Whisper White exteriors. 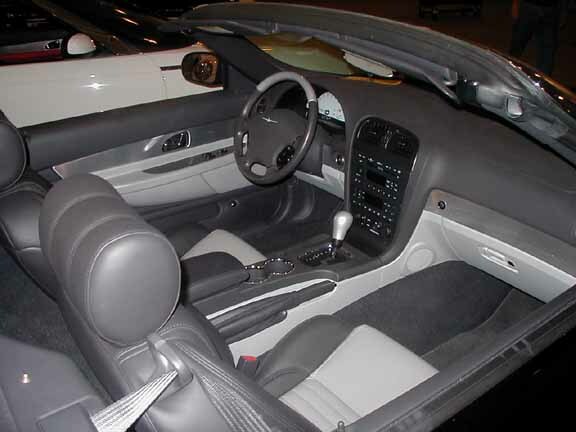 05s - available with Inca Gold exterior only - Performance white hardtop may come with this interior choice if hardtop ordered. 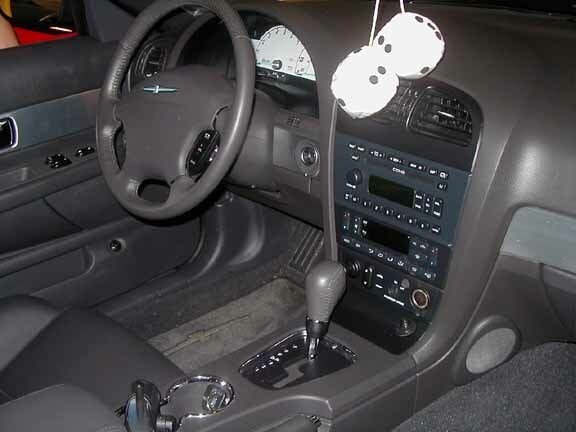 Shift Knob and top of steering wheel are laquered white. 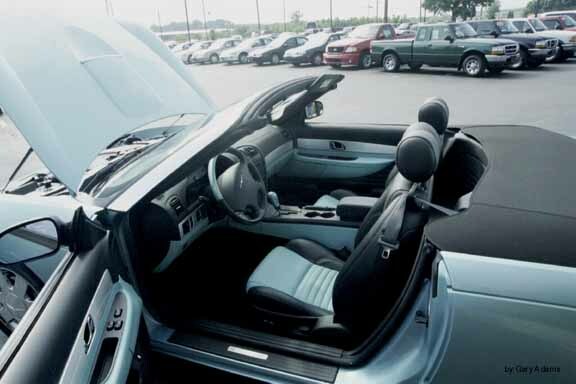 includes the medium steel blue softtop with this color package. 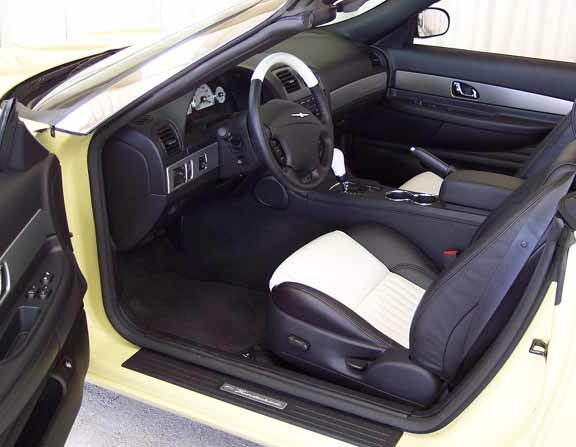 Available with the 05 Silver and Steel Blue exterior colors. 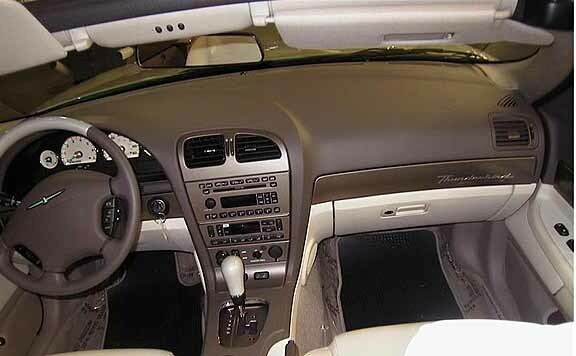 Color applied to shift knob leather. 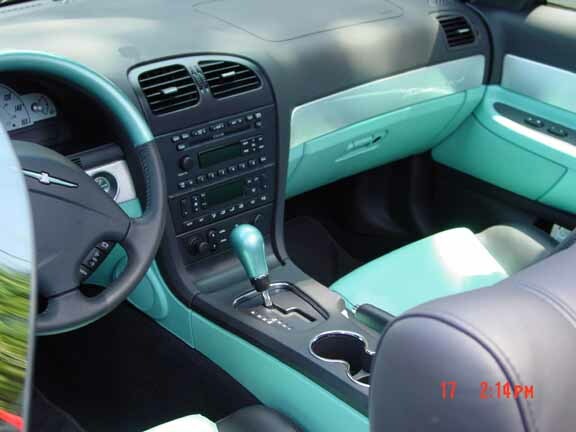 Color applied to seat inserts. Available with Torch Red, Merlot, Platinum Silver, Light Ice Blue, Bronze, Med. Steel Blue and Evening Black exteriors. 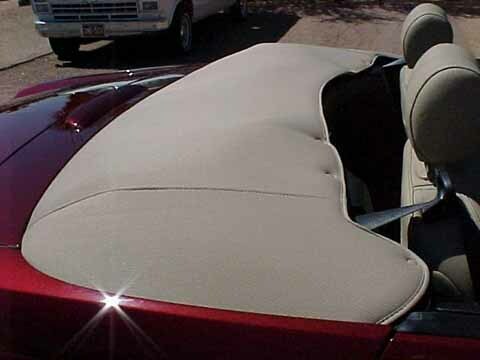 Please read Care page for Soft top care instructions. 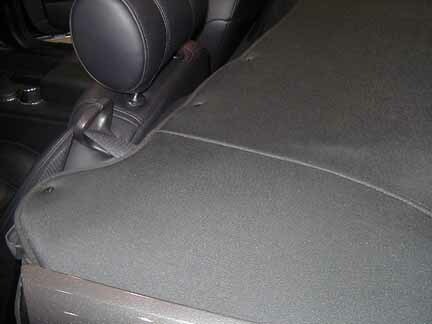 Light Sand binding around the dark gray floor mats. As packed when car is new. Remember, boot is an option - it must be specifically ordered. 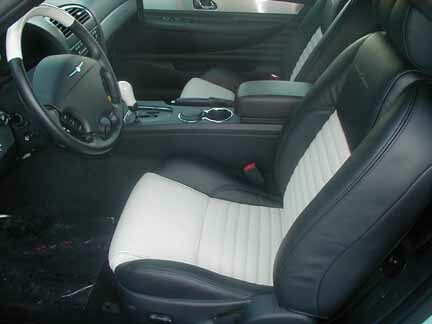 Seats are fully covered in the "light sand" with black accent stitching. 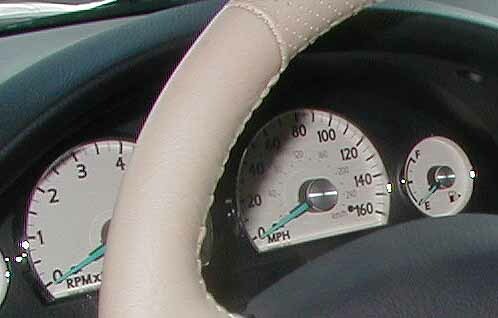 The instrument gauges have a cream background, not white like the other 03 and 04 gauges. 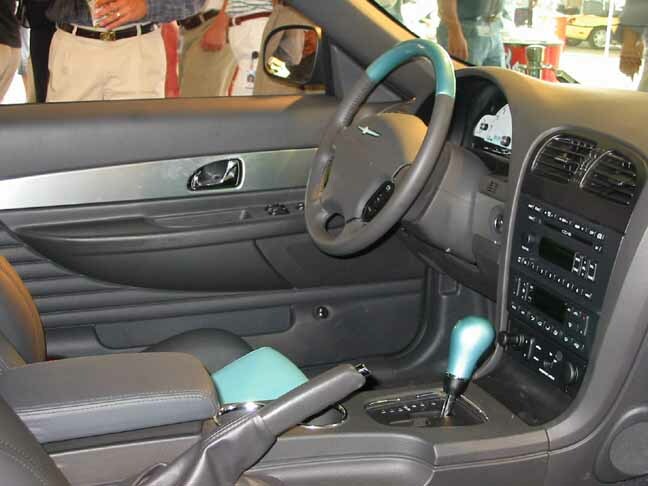 The shifter knob and steering wheel are fully covered in light sand leather. 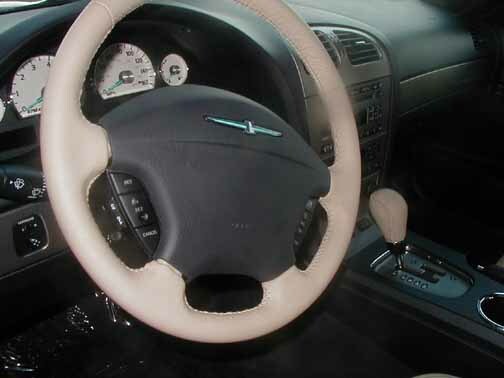 The upper third of steering wheel is perforated leather. 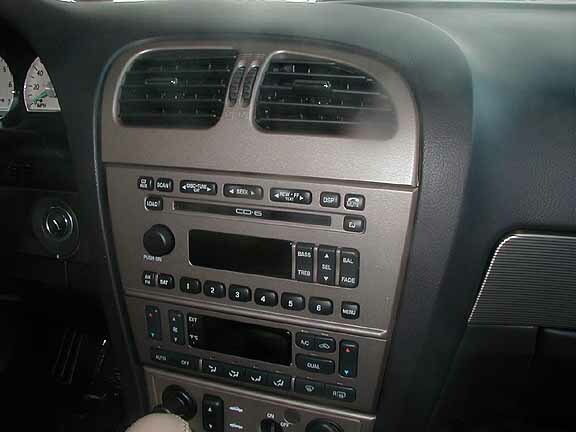 2003, 2004, 2005 = Black Ink btw - gear shift knob is supposedly wood with high gloss enamel paint. 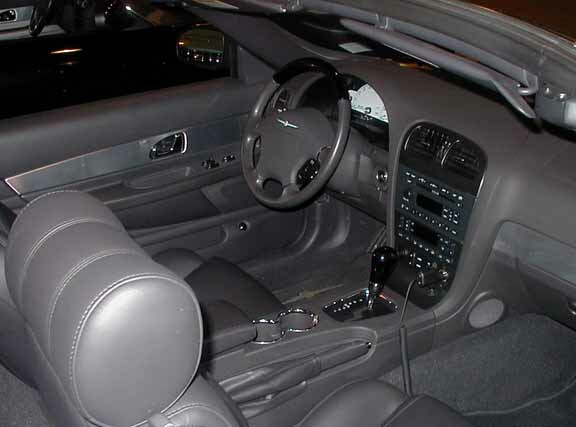 Available with any standard* exterior color choice for 2002 and 2003 2004 & 2005 - The center stack on the black accent interiors has a metallic finish, not noticeable until I used a flash and checked my digital photos when getting back home.. 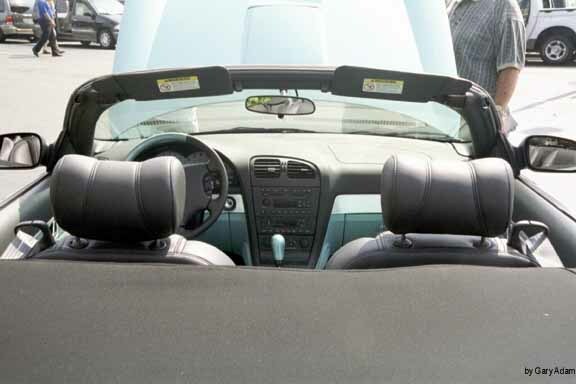 I'll be checking other 2004 models in the future to see how this is carried out through out the rest of the dash, such as the the shift plate and the arm rests and try to compare it with some 2003s. 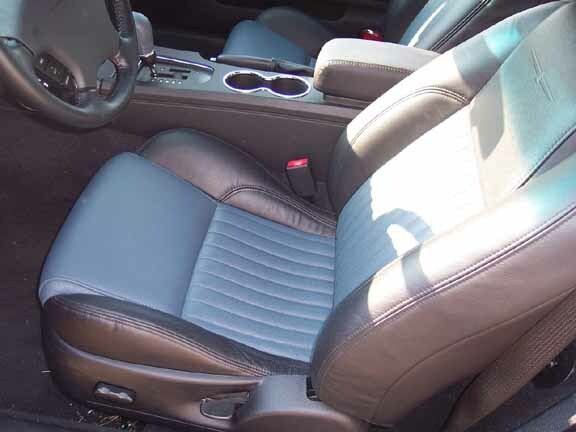 Available with any standard* exterior color choice for 2002, 2003, 2004 and 2005 Top third of steering wheel is perforated leather; lower portions, smooth leather. Standard on all 2002s and 2003, optional on all 2004s and 2005s except the limited editions. Finally updated this section in 2018. 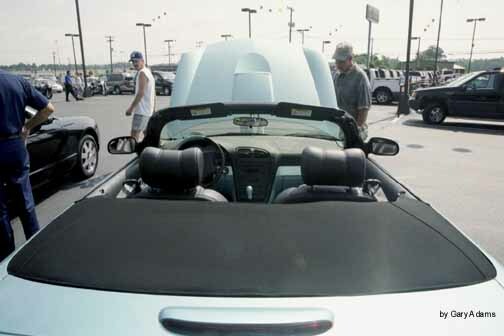 2002 Top off or down Photos How to install the 2002 boot. Install Tip for all years: Lubricate the snaps for ease of snapping and unsnapping. The snaps are tight and may pull from fabric if unlubricated. Lubricate inside of female snap with one of the following: white grease, vaseline, color crayon(wax), bar of soap. Any of these applications should be done 2 or 3 times a years or more often, depending on how often you use your boot. DO NOT get grease, vaseline or wax on your boot fabric as it will stain. Apply with very small artists paint brush or toothpick. Once the snaps are lubricated, the boot goes on and off quickly with little effort. Tip For unsnapping a balky snap: If you haven't lubricated your snap and it appears too tight and might pull thru fabric, use a pocket knife to pry apart the male & female snap. Tip: Tool for unsnapping the snaps: A couple of owners have fashioned tools to use to unsnap the snaps. Check in with TBN to learn about the tools. The Boot 2003 This is a softer boot than the 2002 boot. It replaces the 2002 if you must need a replacement. This boot will fold and store in the small compartment in your trunk. Owners say it's easier to install than the 2002 boot. The snap covers show on the top side. This is the "black" boot that is standard for the 03's and optional for the 04s and 05s. The procedure for installing the 03-05 boot is slightly different. We have found with ours, that doing the snaps first is best, then tuck in the sides and back. Do lubricate the snaps for a quicker install as stated above. Folded correctly the black boots will look like this: The Sand boot folds the same way. 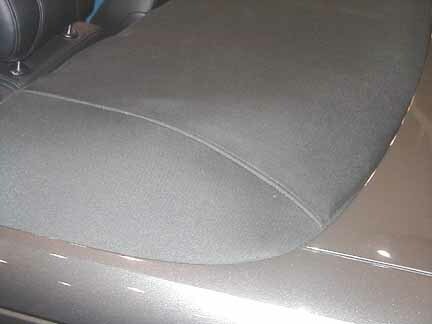 This is the light sand color boot that may have been ordered with the Sand package for 04 and 05.